Hello, aspirants here is another great career building opportunity for job seekers. Navodaya Vidyalaya Samiti has come up with another NVS Recruitment 2019 for the upcoming year. There are vacancies expected for the following year. The job openings will be for TGT and PGT teachers. Find more on the related topic in the following sections of this web page. The Navodaya Vidyalaya Samiti is the well-known organization that recruits eligible job seekers specialized in Teaching. For this year, there will be many vacant seats for the positions of TGTs, PGTs, Principal, Assistant Commissioner, and Miscellaneous Category Teachers. Find more informative points below and know how to apply and fill out the Application Form for these jobs. General application process as per the NVS TGT PGT Notification 2019 is expected to be released in forthcoming days. Following this advertisement, all the aspired candidates can apply for the Graduate and Post Graduate jobs in the state-wise education departments. All the eligibility and education details are well-stated in the further upcoming segment of this web page. Kindly note all the necessary details and be ready to apply following the NVS Recruitment 2019. Applicant must have completed M.Sc. from an NCERT recognized institution qualifying with a minimum of 50%. Candidates must have finished 04 years integrated course from any institution recognized by NCERT. Aspirants need to attain a degree in Library Science from any recognized University or Institution. Applicants must have a valid B.Ed. or a certified Teaching Degree securing a minimum of 50% marks. S/He must hold a working experience with any of the Government /Semi Govt. School. Applicants need to be Post Graduates in Humanities/Science/Commerce from a recognized institution or University. PGT Posts: Maximum Age limit is 40 years. TGT Posts: Upper age limit is 35 years. Miscellaneous Category Teachers: 35 years. Assistant Commissioner Posts: Upper age limit for this position is 45 years. For Principal and Assistant Commissioner Posts, the amount payable is Rs. 1500/-. For other posts, the application fee is Rs. 100/-. There will be no application whatsoever for the candidates belonging to the SC/ST and PWD communities. After an appointment, the selected aspirants will be awarded a salary structure based on these details here. Download the official Recruitment Notice for the above-specified jobs. Read it carefully before applying, get it printed for convenience. Start applying online by giving your true details including academic as well as professional information. Complete the form filling process and verify your entered data. Pay your fee amount through Bank Challan. Get a printed version of your application form. According to the information, the Navodaya Vidyalaya Samiti recruitment notification 2019 is going to be released for various Principal, PGT TGT, Miscellaneous Teachers and TGT. The Navodaya Vidyalaya Samiti recruitment Online Application Form 2019 started soon. We aware all our dear users submit their NVS application form before the ending date via online mode only. If the applicants have any query regarding this then comment us. 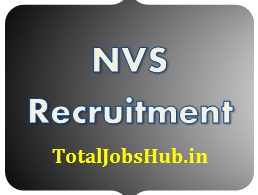 All such candidates who have a desire to apply online for NVS Recruitment 2019, they have to wait quite a little bit more. Whenever the department released any kind of Advertisement or Jobs Notification related NVS TGT PGT Teachers Vacancy you can easily obtain the details from here.